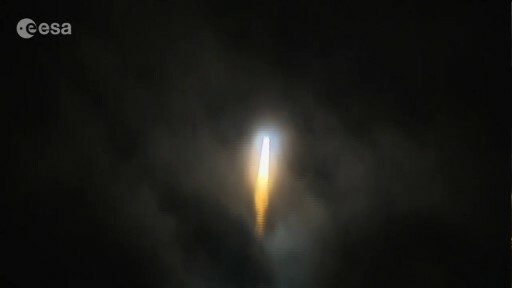 A Rockot launch vehicle rumbled into the night sky over Russia on Tuesday, lifting into orbit Europe’s Sentinel-3A satellite, joining the Copernicus Earth Observation Program as the constellation’s most heavily instrumented satellite launched to date. Sentinel-3A is outfitted with four instruments to deliver accurate data on land and ocean color and topography as well as sea and land surface temperature with a rapid global revisit time and fast data availability for use in operational applications. 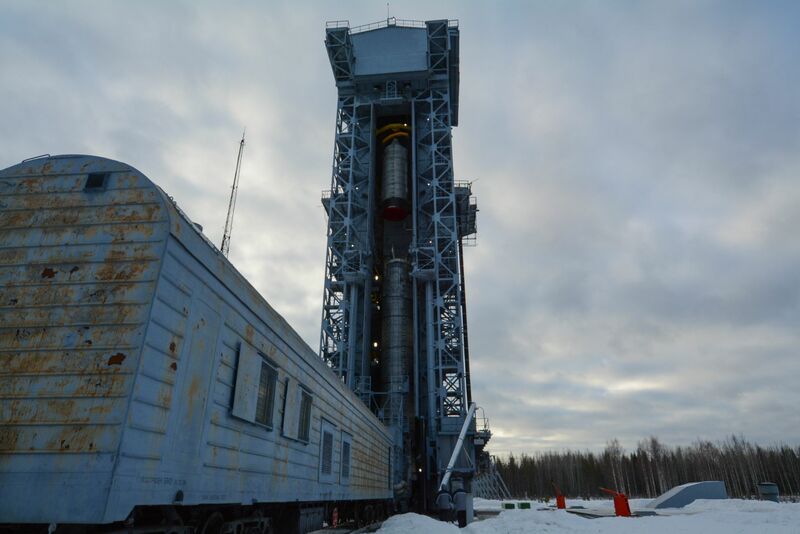 Liftoff from the Plesetsk Cosmodrome took place at 17:57 UTC and Rockot’s two ICBM stages were in action for just over five minutes before handing over to the Briz-KM upper stage for a two-burn mission. 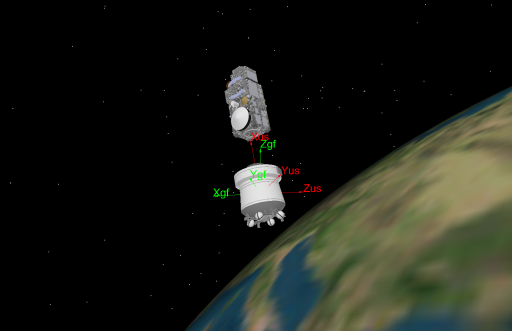 Briz-KM conducted an initial firing of nine minutes to push the stack into orbit followed by a one-hour coast ahead of a half-minute circularization maneuver. Sentinel-3A was released to an orbit over 800 Kilometers in altitude one hour and 19 minutes after launch, ready to begin its mission of keeping a close eye on Earth and its Oceans. Sentinel-3A joins the Sentinel-1B and Sentinel-2 satellites launched atop Soyuz and Vega rockets in 2014 and 2015 to begin the deployment of Europe’s Copernicus constellation, a program designed to provide independent access to relevant Earth observation parameters. Copernicus collects a complete set of Earth Observation Parameters by deploying a series of satellites to orbit outfitted with a range of instruments including optical imagers, multispectral payloads, radars, microwave instruments and spectrometers. The Sentinel-3 mission, outlined as a two-satellite constellation, is the most comprehensive of the program to date with four instruments installed on the satellites as opposed to Sentinel-1 and 2 that carry only one specialized instrument each. 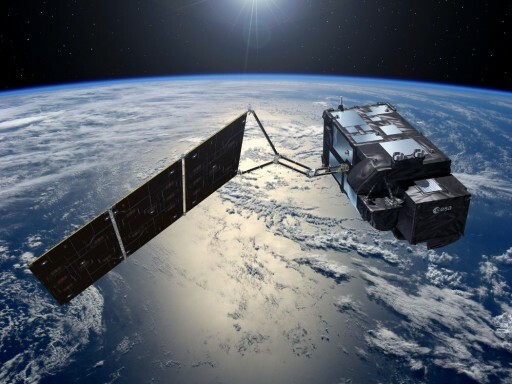 Sentinel-3A will collect multi-spectral Earth imagery to measure ocean and land color, radar and microwave radiometer data will be used for topography measurements over land and sea, and a temperature radiometer will provide global surface temperature measurements. As an operational mission, Sentinel-3 implements a high-degree of automation on the satellite and the ground segment to be able to release data products within three hours of acquisition. 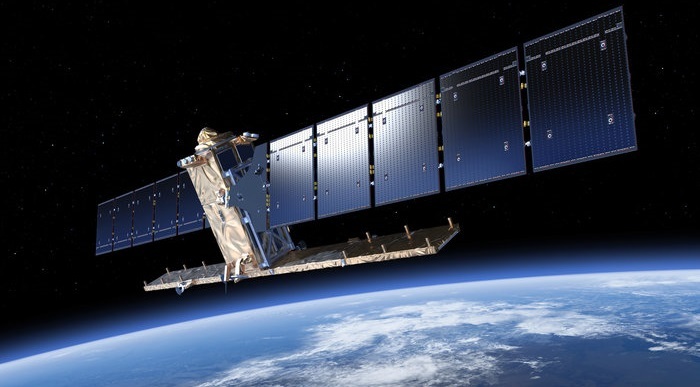 Data from Sentinel-3 will be used for a variety of purposes ranging from environmental monitoring and sea state assessments to fire detection, marine forecasting, vegetation monitoring and atmospheric studies related to clouds, aerosols and pollution. The Copernicus Program’s global surveys will be used by policy-makers, maritime operators, scientists, meteorologists and resource managers. Taking the pulse of an ever-changing planet, the Copernicus satellite constellation is expected to finish deployment by 2020. Sentinel-3B, identical to the 3A satellite and also built by Thales Alenia Space, is currently looking forward to launch in 2017 and two more satellites were ordered from Thales last week to continue the Sentinel-3 data record beyond the lifetime of the first two satellites. Copernicus is operated by the European Commission, ESA and EUMETSAT and represents Europe’s single most expensive space project with a cost of a projected $10 billion by 2020. Sentinel-3’s multi-function payload covering optical and microwave measurements will be a workhorse for the Copernicus program. Each of the 1,150-Kilogram satellites is expected to operate for seven years and keep up a steady pipeline of data delivered to users shortly after being sent down from the spacecraft. For its ride into orbit, Sentinel-3A relied on Rockot – a converted UR-100N Intercontinental Ballistic Missile, developed in the 1970s and first flown as a space launch vehicle in the 1990s. Tuesday’s mission was Rockot’s 25th orbital launch and carried the name Libra, a constellation that can be drawn with 25 bright stars. 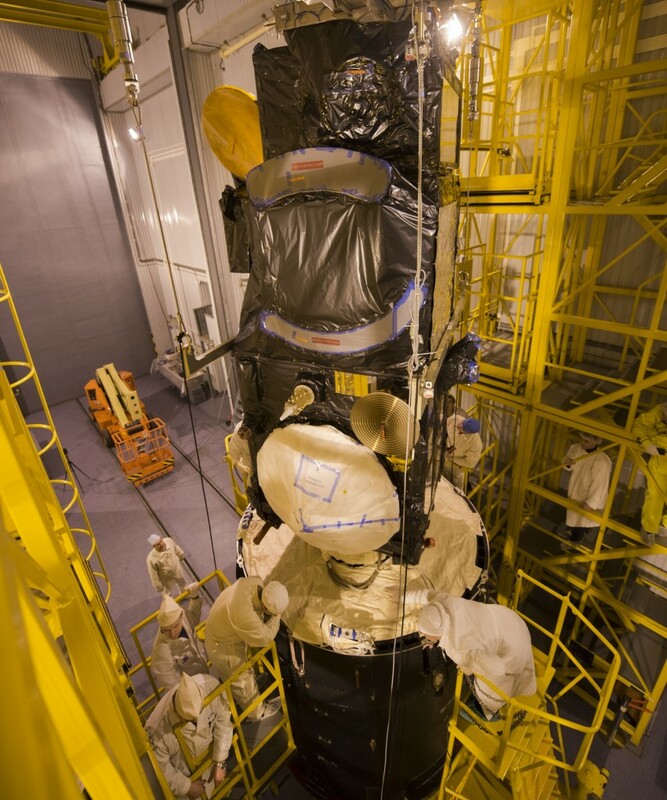 After a long road to launch, Sentinel-3A took its place atop Rockot on Friday and Russian technicians filled the two stages of the launcher with nearly 85 metric tons of toxic hydrazine and nitrogen tetroxide propellants on Monday. Countdown operations were initiated seven hours ahead of T-0 when teams at the European Space Operations Center began calling up the ground stations involved in the mission while the spacecraft team in Plesetsk started a number of checkouts and reconfigurations on the Sentinel-3A satellite. The Russian State Commission provided clearance for launch at T-6 hours and Rockot headed into its countdown sequence at T-3 hours to go through checkouts of the Guidance, Navigation and Control System ahead of flight software load. The Briz-KM upper stage also went through a multi-hour countdown during which it was fully checked out and received its flight parameters to be ready to give Sentinel-3A its final boost to orbit. One hour ahead of launch, the complex at Site 133 was cleared after hands-on work on the Rockot launcher and its above-ground launch container wrapped up. Rockot was revealed just ten minutes prior to launch when the Mobile Service Tower was rolled back from the 29-meter tall rocket. Sentinel-3A was transitioned to internal power and the final clearance for liftoff was provided to the Russian Launch Team in charge of the Rockot launch vehicle. Rockot headed into its Automated Launch Sequence at T-3 minutes, going through a series of irreversible steps such as the pressurization of its tanks, opening of fuel valves, the transfer to internal power and the activation of the guidance platform. When clocks hit zero, Rockot finished Final Gyro Settling and initialized its guidance system for liftoff. Rockot ignited its four first stage engines and lifted off at precisely 17:57:45.065 UTC, rising from its launch tube, initially guided by rails. Thundering off, Rockot completed a short vertical ascent before starting to pitch and roll to align itself with its planned ascent path to the north west. Rockot quickly punched through a thick layer of clouds with a total thrust of 191 metric-ton-force as it started its five-minute climb. Consuming nearly 600kg of propellants per second, Rockot’s first stage was powered by a cluster of three RD-0233 engines and one RD-0234 which quickly accelerated the vehicle to the speed of sound. 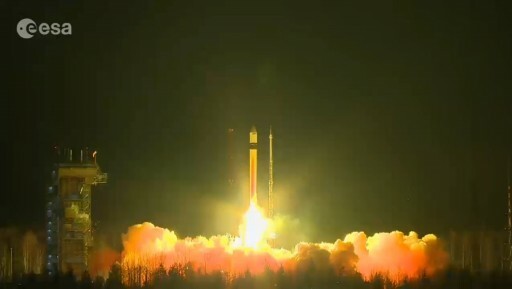 The launch vehicle encountered Maximum Dynamic Pressure 50 seconds after lifting off, passing 11 Kilometers in altitude and traveling at 570 meters per second. At T+2 minutes and 16 seconds, the four-chamber RD-0236 vernier engine of the second stage was ignited and soared up to full thrust of 1,600 Kilogram-force as its exhaust was directed through four hatches on the first stage. Shutdown of the first stage came at T+2:19 and was followed split-seconds later by the separation of the first stage, assisted by four retrorockets that pushed the first stage away to clear the way for the second stage to ignite its main engine. Following separation at an altitude of 68 Kilometers, the first stage was set to impact 1,080 Kilometers from the launch site. The RD-0235 main engine of the second stage throttled up to a total thrust of 24,500 Kilogram-force for a burn of just under three minutes to lift the vehicle out of the atmosphere. The four gimbaling nozzles of the vernier engine delivered vehicle control during second stage flight. When the stack reached an altitude of 120 Kilometers, it was safe to jettison the protective payload fairing and expose the Sentinel-3 satellite as aerodynamic forces could no longer harm the delicate payloads. Fairing separation occurred at T+3:04 when the vehicle was already moving at 3.6 Kilometers per second. Rockot’s job was done at T+5 minutes and 19 seconds when it shut down its second stage and released the orbital unit on a sub-orbital trajectory. Two seconds after staging, the Briz-KM ignited its four 392-Newton vernier engines for propellant settling ahead of main engine ignition on a burn of nine minutes and nine seconds to lift the stack into an Elliptical Transfer Orbit. Overall, Briz-KM is 2.6 meters long and launches with a propellant load of nearly 5 metric tons, also using Unsymmetrical Dimethylhydrazine and Nitrogen Tetroxide like the first two stages of Rockot. The 2,000 Kilogram-force S5.98 engine was still firing when the launcher headed out of communications range, aiming for an orbit of 153 by 785 Kilometers. 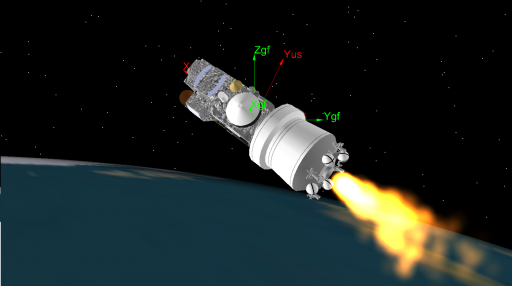 Successfully achieving orbit, the Briz-KM was set for an hour-long coast to climb to the high-point of the orbit so that the second burn could act as a circularization maneuver. The planned 32-second firing was completed near Madagascar and targeted an orbit of 801 by 817 Kilometers, inclined 98.46°. Sentinel-3A was sent on its way 89 minutes after launch and all eyes were on the screens at ESOC where the first signals from the spacecraft were awaited to appear, coming through the Kiruna Ground Station in Sweden. Immediately after separation, Sentinel-3A switched on its transmitter and began reducing body rates in an autonomous sequence designed to ensure the satellite reached a stable attitude before commanding its solar panel to deploy. Signals arriving at ESOC confirmed the satellite was healthy and began unfurling the solar array, marking a successful orbital insertion. The completion of solar array deployment was confirmed and the battery of the satellite was being charged after a very smooth ride into orbit. Throughout the night and the next three days, teams at ESOC will put the satellite through a series of tests and reconfigurations to ensure Sentinel-3A is healthy and ready for the activation of its instruments. The $400 million Sentinel-3A satellite is expected to be fully operational by July and begin delivering a steady stream of data, keeping tabs on an ever-changing planet. The initial weeks and months of data from Sentinel-3A will be studied closely to identify any deficiencies that may need to be addressed before the Sentinel-3B satellite rides into orbit atop a Vega rocket by the end of 2017.